A little boy in a big museum, that is how we started this stage of our art appreciation efforts here in Europe. Certainly, being the child of artists, there is a certain level of art gazing expected. But, as my husband and I have both been learning as the parents of two small children, we have to build their museum and gallery stamina gradually not to mention their appreciation for art. Back home in the USA, we are avid art museum goers, so to a certain extent our children know the drill. However, here in Europe, the museums have been more numerous and the art collections a bit more vast. It has been a real joy to introduce our 6 year old to many of the old masters. He is finally beginning to understand the concept of something being aged and valuable. We have gotten the opportunity to explain why we wanted to seek out some of these artworks and, how in a sense, it is much like a treasure hunt. Whether he wants to or not, he gets to hear how and why we appreciate and love certain art pieces. However, it isn’t just about him hearing from us, as we are also learning how to foster him making his own connections with art, picking his favorites and telling us why. It has been enlightening to see which artwork catches his child’s eye as often they are ones we have yet to notice. All these years of dragging our children to museums, negotiating and even on occasion bribing our way through, may just be finally paying off. This week’s treasure hunt took us to the Musee Unterlinden in Colmar, France to see the famous Isenheim altarpiece painted by Grunewald in the early 1500’s (a recommended bucket list item). As we bought our tickets and received our audio guides, we assured the attendant that our son would not be interested in one. However, it didn’t take long for us to realize how wrong we were! Yes, he started the tour more interested in his toy sword hanging around his waist. And, yes, we had to remind him several times that this environment resembled one of a church or library, with no running around or talking loudly. He tried to behave, but it wasn’t until I offered him to listen along with me to the audio guide, that something seemed to click. I can only gather that is much like listening to an audio book for him, as the narrator described the images in detail and helped him to understand more of the story in each piece. 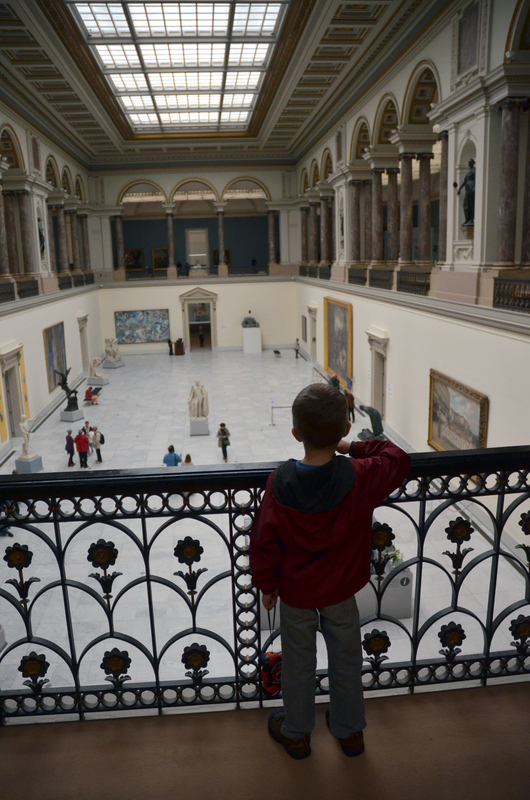 Before long, my son was walking around the gallery all on his own listening to the guide. We have officially reached the next stage. How thrilling! So special! I love how kids surprise us with their readiness for things when we least expect it. Blessings as you all travel on!